In case you hadn’t heard, eastern Pennsylvania had some snow on Thursday. Way more snow fell than people expected, which caused some problems on roads. Below you can find first-hand footage of Snow Camel, which Twitter user @Tylerkio said was filmed on Route 309 South near Sellersville. 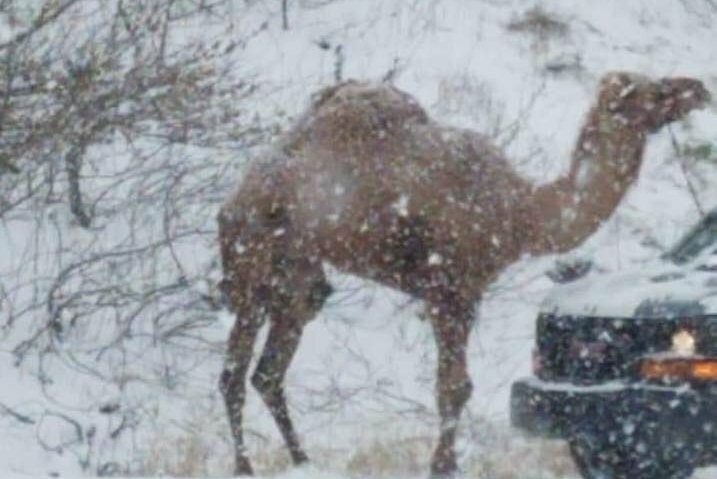 We’ll be honest: the commentary in that video absolutely seems like the appropriate response to seeing a camel on the side of the road… in a snowstorm… in Pennsylvania. Why is Snow Camel here? Unfortunately, we’re not entirely sure. Details are pretty hard to come by, because no one wanted to stop their car to ask for fear of being stuck on the roads for hours. Update, 9:15 p.m.: According to the Jewish Federation of Greater Philadelphia's latest tweet, the weather prevented Einstein the camel from reaching the Kimmel Center. Einstein is heading back to the Peaceable Kingdom Petting Zoo. Thankfully, it seems Einstein made it through his roadside ordeal safe and sound. One thing is for sure: until further notice, Snow Camel is the mascot for this winter.